Sir Peter Luff (Mid Worcestershire) (Con): What assessment she has made of the effectiveness of her Department’s support for the Palestinian Authority. Aid Minister Alan Duncan: The UK is providing effective support for the Palestinian Authority in very challenging circumstances. The Palestinian Authority has developed institutions to the point where the international community has recognised it as technically ready for statehood, and it has made impressive progress in delivering improved outcomes in health and education. Sir Peter Luff: Having just returned from a Select Committee visit to the Palestinian occupied territories and seen the excellent work being done there by the Department, may I ask whether the Minister agrees that its work to support the private sector would be much more effective if Israel lifted many of its restrictions, which can have nothing to do with its essential security, on the freedom of Palestinian business people to develop their economy in areas such as the banking sector, water supply, and even 3G telephone networks? Mr Duncan: I am grateful to him for his appreciation of DFID’s work in the occupied Palestinian territories and glad that he and the Committee had such a useful visit. Israeli restrictions do tremendous damage to the economy and to the living standards of ordinary Palestinians. The simple truth is that they are not allowed to develop their banking or information and communications technology sectors, or to build even their basic infrastructure. Were these restrictions to be lifted, not only would DFID’s work to support the private sector be much more effective, but within a relatively short space of time the Palestinians would probably not need our aid at all. Richard Burden (Birmingham, Northfield) (Lab): Is the Minister aware that the World Bank has said that Area C of the West Bank, particularly the Jordan valley, is vital to the future economic viability of a Palestinian state? Presumably that is why the Department is looking to fund infrastructure projects there. What is his view of the fact that illegal Israeli planning restrictions are stopping those infrastructure projects being built, and for how long will the Government allow Israel to have a veto over economic development in the West Bank? Mr Duncan: I fully understand what he says. I think the Select Committee saw a direct example of the destruction of olive groves when it was there. It is essential that area C is able, through planning arrangements, to develop its economy; otherwise there can be no sensible or useful economic future in the Palestinian territories. Sir Malcolm Bruce (Gordon) (LD): May I confirm what the Minister says—that without access to area C there is no future for a two-state solution or for an economically viable Palestine? The Palestinian Authority pleaded with us to put all possible pressure on Israel to allow access. We met someone from a company who is saying that the cost of land in areas A and B is prohibitive and that without access to area C he cannot develop his business. Mr Duncan: I fully concur with him. I hope that a full understanding of this can be included in the peace talks that we hope are continuing towards a productive and useful conclusion. Mark Lazarowicz (Edinburgh North and Leith) (Lab/Co-op): What recent representations have the Government made to the Israeli authorities about the continued forcible removal of populations, and property demolition, in the occupied territories? Yesterday the Foreign Secretary met the Israeli Minister for International Relations: was this issue raised with him? Mr Duncan: I was also at that meeting, and I can assure the Member that we raise such matters regularly. It is essential that some kind of normal activity can be permitted in the occupied Palestinian territories; otherwise, as Sir Malcolm Bruce said, there will not be a two-state solution and there is a danger of permanent conflict and tension. On Tuesday 1st April Ahmed Kathrada came to speak at the House of Commons. 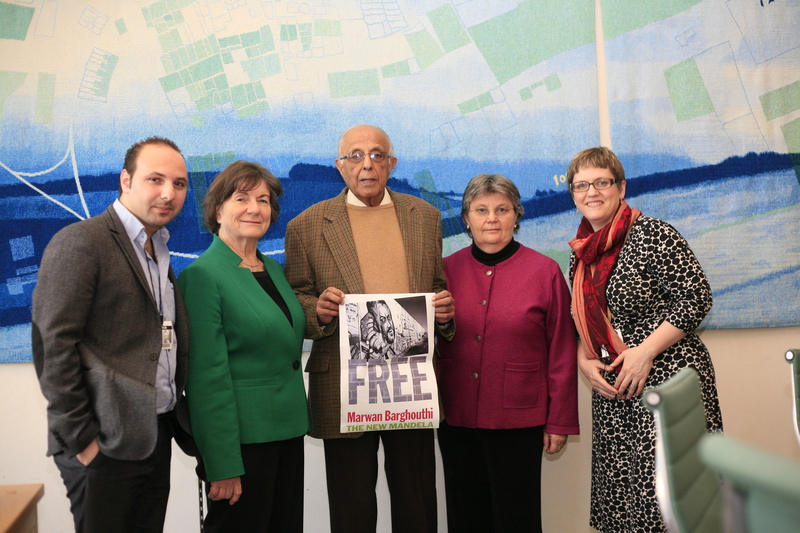 He called on members of the All Party Parliamentary Britain-Palestine group and the invited guests to join the campaign to free Marwan Barghouti, Palestine’s most significant political prisoner. Martin Linton, Richard Burden, Ahmed Kathrada, Dan Judelson, Fadel Takrouri and Andy Slaughter MP. Copyright held by Martin Linton of Palestine Briefing. Picture not to be used without permission. The meeting was organised by the All Party Parliamentary Britain-Palestine group and Palestine Briefing, timed just after the expected release of the fourth group of Palestine’s political prisoners from Israeli prisons. Ahmed Kathrada – like the man he was there to talk about – is of huge symbolic importance for Palestine solidarity. The man who began the first campaign – in the 1960s – to free Nelson Mandela, a man regarded by the majority of the western world as a terrorist at the time – only to be jailed himself for many years. Ahmed Kathrada has shown huge personal, political and physical courage over his long life and heading up the campaign to free Marwan Barghouti. Mr Kathrada told us of how he took Fadwa Barghouti, Marwan’s wife and Fateh Council member, to the cell in Robben Island that Nelson Mandela had occupied. It took time but eventually the authorities acceded to all those demands. Palestinian Ambassador, Professor Manuel Hassassian, delivered a powerful speech, thanking Ahmed Kathrada for his presence. He pointed out that in fact pre-Oslo prisoners were meant to be released as part of the Oslo process, so in fact Israel has now failed to honour its commitment to free them several times. This prisoner release was not part of the Kerry plan, but was in fact agreed before that: the Palestinian leadership agreed not to go to the UN bodies and the ICC in exchange for the release of the prisoners. The Ambassador said it was right that Marwan should be the symbol for the struggle to release the Palestinian prisoners because of his outstanding popularity and he is the uncontested symbol of the Palestinian prisoners. The invited audience included many notable individuals including: Afif Safieh from Fateh’s council, Betty Hunter Honorary President of Palestine Solidarity Campaign, Ziad El Aloul from Palestinian Forum of Britain, Aimee Shalan from Medical Aid for Palestinians. Afif Safieh talked about the moving first meeting between Yasser Arafat and Nelson Mandela, and how Mandela had said the liberation of South Africa was incomplete without the Palestinians. It was notable what a strong presence of Palestinians there was in the audience, which is perhaps not surprising as Marwan Barghouti polls as the most popular Palestinian politician within the West Bank and Gaza. But Marwan Barghouti has been explicit himself that this is a campaign for all the political prisoners, of which he is a symbol.